Last year we hinted that another Thunderbolt revision would happen this year, with a speed bump in 2014. It turns out that's exactly what's being announced at NAB this week. Intel took the opportunity to unveil its first 2013 Thunderbolt controllers as well as tease next year's Thunderbolt spec update. As a refresher, Cactus Ridge was the codename of the Thunderbolt controllers that accompanied Ivy Bridge systems. Haswell gets a new set of controllers: Redwood Ridge. Intel is announcing two this week: the DSL4510 and DSL4410. These two are replacements for Intel's current DSL3510 and DSL3310, with 4/2 and 2/1 (channels/ports) respectively. There are no performance changes other than official support for DisplayPort 1.2 (and thus 4K displays). If you connect either of these parts to a Thunderbolt display you still only get DP 1.1a support. There's still a PCIe gen 2 x4 interface on the other end of these controllers. The Redwood Ridge parts should be a little cheaper as they integrate a 1V voltage regulator that used to be external. The integration also reduces board area by a bit. Power consumption is also lower at idle compared to Cactus Ridge, and disconnected power consumption is significantly lower (1mW vs. 7mW for Cactus Ridge). Redwood Ridge includes the appropriate hooks for Haswell's upcoming aggressive platform power management reductions. Ultimately this is the real focus behind Redwood Ridge. With Haswell, all components on the platform need to be more power efficient - Intel's own silicon included. Next year Intel will introduce Falcon Ridge, the first real performance upgrade to Thunderbolt. Intel is only mentioning an increase in performance to 20Gbps, which I can only assume refers to signaling speed per Thunderbolt lane. If that's correct we'd be looking at a doubling in peak theoretical bandwidth over Thunderbolt, perhaps finally making this interface useful for external GPUs. No word on a release timeframe for Falcon Ridge, but my guess is that we'll see it debut around Broadwell (14nm Haswell shrink). Given that Haswell is a late Q2/Q3 launch at best, I'd say end of 2014 is likely for Falcon Ridge. Dropping power, BOM cost and increase performance in the future are all great, but Thunderbolt adoption on the PC remains embarassing at best. There's a lot of finger pointing between Intel and Microsoft on this, but none of it matters to the end user. Apple continues to be the only platform player that seems to get Thunderbolt and take it seriously. If Intel wants Redwood or Falcon Ridge to matter, it needs to make sure that we actually see real adoption of Thunderbolt in the PC space - with backwards compatibility guaranteed between those devices that have been shipping on the market for a couple of years now. 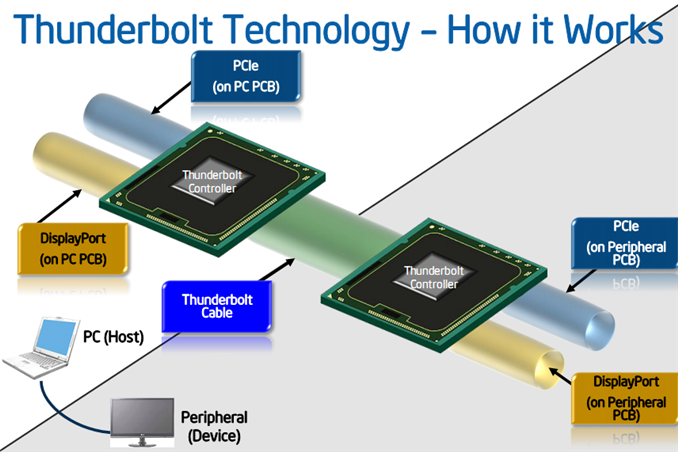 The first and second gen Thunderbolt controllers (Light/Eagle/Cactus Ridge) were designed specifically to accompany LGA 1155 Sandy Bridge and Ivy Bridge systems. Mac Pros are Xeon based. The lack of an LGA 2011 Xeon with integrated graphics or some other graceful means of piping the DisplayPort output from the dGPU to the Thunderbolt controller is more the issue at hand. Until this past December, DisplayPort 1.2 displays weren't even available, so it's not like Thunderbolt being limited to DP 1.1a would have held the Mac Pro refresh back in any way. Thunderbolt controllers are somewhat generic. However, a Thunderbolt add-in card for PC's hasn't reached the market for the same reasons why it hasn't appeared on the Mac Pro: tunneling video through it. Outside of socket LGA 1155 motherboards which have integrated graphics to funnel, the only other logical spot would be on a discrete video card. Neither nVidia or AMD wish to support this standard. In the case of Apple, they'd have to design their own discrete card for this purpose. Ivy Bridge-EP is probably the key here simply. Nothing else happens on the Xeon side. Haswell-based system would take a sidestep for it from being a workstation. Nehalem/Westmere is still pretty powerful. If intel integrated Thunderbolt into the chipset, it would be a great gift to AMD since it would drive up the price of their chipsets.